A new facility has opened in Reading, to safeguard the future of chocolate. It is a bigger and better clearing house for all the world's new cocoa varieties, which must be quarantined before they can be grown. Demand for chocolate is increasing faster than the global supply of cocoa, of which an estimated 30% is lost to pests and disease each year. New varieties are key to solving this problem, and the International Cocoa Quarantine Centre is the gatekeeper. Since 1985, when the University of Reading took over the job from the Royal Botanical Gardens in Kew, all new cocoa seeds and plants have passed through a facility in Shinfield, a few miles from the university. "One of the principal issues concerning cocoa improvement is the supply of reliably clean, healthy, interesting cocoa material," said Prof Paul Hadley, the cocoa project leader at the University of Reading. "You need some mechanism to make sure that if you are transferring the stuff, you're not transferring pests and diseases." The centre's £1m purpose-built new home has been operating for a month. It consolidates the collection of 400 varieties into a single, improved greenhouse and should make the quarantine process faster, cheaper and greener. "We use a lot of energy keeping the cocoa plants in tropical conditions, and we can do that much more efficiently in this new facility," Prof Hadley told the BBC. The cool UK climate is valuable as well because it means the International Cocoa Quarantine Centre (ICQC) is isolated from the sort of diseases that can affect cocoa in places nearer its origin, like South and Central America and the Caribbean. After up to two years in quarantine, clean and safe cocoa seeds are shipped from Reading to some 20 different countries, including several in West Africa. That region produces 75% of the cocoa used for chocolate worldwide. The crop is crucial to the regional economy and employs two million people. If new pests or disease reached West Africa, Prof Hadley said, it would "absolutely devastate the industry". Even while these threats are largely kept at bay, our global appetite for chocolate already shows signs of outstripping supply. "There is some concern within the industry that demand is increasing relentlessly - particularly in countries like China, where the standard of living is increasing and people are getting a taste for some of these confectionaries," Prof Hadley said. "So the demand is going up, but the supply, unless something is done, really can't keep pace." But Prof Hadley believes that a chocolate crisis can be averted. A lot of effort is being put into improving both the crop and its production. "Most cocoa is produced by subsistence farmers, who might be farming one or two hectares. As well as needing new, more efficient varieties, they also need to improve the way they grow the cocoa. "Putting those two things together, I'm pretty confident. If we did nothing then there would be a crisis, but there's a lot of effort internationally. Those breeding programmes rely on the Reading facility to supply new genetic material - a critical link in the global network. 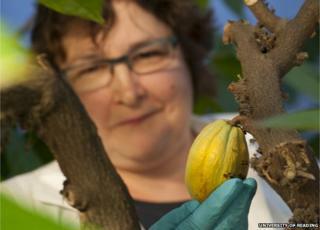 Although Prof Hadley runs a large cocoa research programme within the university, the ICQC's precious collection is largely in the hands of "two very green-fingered technicians", he said. "It's a small team, with a big responsibility." Is Ecuador home to the world's best chocolate? Plant pests: The biggest threats to food security?